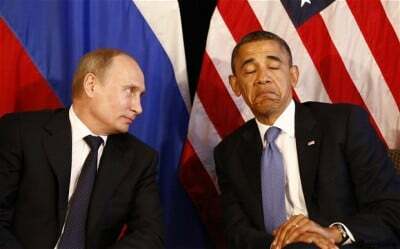 Will US Grasp Putin’s Syria Lifeline? Russian President Vladimir Putin has thrown U.S. policymakers what amounts to a lifeline to pull them out of the quicksand that is the Syrian war, but Official Washington’s neocons and the mainstream U.S. news media are growling about Putin’s audacity and challenging his motives. For instance, The New York Times’ lead editorial on Monday accused Putin of “dangerously building up Russia’s military presence” in Syria, even though Putin’s stated goal is to help crush the Sunni jihadists in the Islamic State and other extremist movements. The Times then reprises the bizarre neocon argument that the best way to solve the threat from the Islamic State, Al Qaeda and other jihadist forces is to eliminate Syrian President Bashar al-Assad and his military who have been the principal obstacles to an outright victory by the Sunni terrorist groups. The dreamy Times/neocon prescription continues to be that “regime change” in Damascus would finally lead to the emergence of the mythical “moderate” rebels who would somehow prevail over the far more numerous and far better armed extremists. This perspective ignores the fact that after a $500 million training project for these “moderates,” the U.S. military says four or five fighters are now on the battlefield inside Syria. In other words, the members of this U.S.-trained brigade can be counted on the fingers of one hand. But rather than rethink Official Washington’s goofy “group think” on Syria – or provide readers a fuller history of the Syrian conflict – the Times moves on to blame Putin for the mess. “No one should be fooled about Russia’s culpability in Syria’s agony,” the Times writes. This “group think” ignores the early role of Sunni extremists in killing police and soldiers and thus provoking the harsh retaliation that followed. But the Syrian narrative, according to The New York Times, is that the “white-hat” protesters were simply set upon by the “black-hat” government. The Times’ simplistic storyline fits neatly with what the influential neoconservatives want the West to believe, since the neocons have had Syria on their “regime change” list, alongside Iraq and Iran, since the list was compiled as part of Israeli leader Benjamin Netanyahu’s 1996 political campaign. The Times’ narrative also leaves out the crucial role of Turkey, Saudi Arabia, Qatar and other U.S. “allies” in supporting Al Qaeda and its Islamic State spinoff. Further complicating Official Washington’s let’s-blame-Putin Syrian narrative is the unintended role of President George W. Bush and the U.S. military in laying the groundwork for these brutal Sunni extremist movements through the invasion of Iraq last decade. After all, it was only in reaction to the U.S. military presence that “Al Qaeda in Iraq” took root in Iraqi and then Syrian territory. Not only did the ouster and execution of Sunni leader Saddam Hussein alienate the region’s Sunnis, but Bush’s desperation to avert an outright military defeat in Iraq during his second term led him to authorize the payment of billions of dollars to Sunni fighters to get them to stop shooting at American soldiers and to give Bush time to negotiate a U.S. troop withdrawal. But what the U.S. intelligence community is only now assessing is the collateral damage caused by the bribes that the Bush administration paid to Sunni insurgents. Some of the cash appears to have become seed money for the transformation of “Al Qaeda in Iraq” into the Islamic State as Sunnis, who continued to be disenfranchised by Iraq’s Shiite-dominated government, expanded their sectarian war into Syria. Besides the Iraqi Sunnis, Syria’s secular government, with Assad and other key leaders from the Alawite branch of Shiite Islam, also was set upon by home-grown Sunni extremists and foreign jihadists, some of whom joined the Islamic State but mostly coalesced around Al Qaeda’s Nusra Front and other radical forces. Though the Islamic State had originated as “Al Qaeda in Iraq” (or AQI), it evolved into an even more bloodthirsty force and, in Syria, split off from Al Qaeda central. In other words, Assad’s early complaint about “terrorists” having infiltrated the opposition had a basis in fact. Early in the disorders in 2011, there were cases of armed elements killing police and soldiers. Later, there were terrorist bombings targeting senior Syrian government officials, including a July 18, 2012 explosion – deemed a suicide bombing by government officials – that killed Syrian Defense Minister General Dawoud Rajiha and Assef Shawkat, the deputy defense minister and Assad’s brother-in-law. By then, it had become clear that Saudi Arabia, Qatar, Turkey and other Sunni-ruled countries were funneling money and other help to jihadist rebels seeking to oust Assad’s regime, which was considered a protector of Christians, Shiites, Alawites and other minorities fearing persecution if Sunni extremists prevailed. The DIA analysts already understood the risks that AQI represented both to Syria and Iraq. The report included a stark warning about the expansion of AQI, which was changing into the Islamic State or what the DIA referred to as ISI. The brutal armed movement was seeing its ranks swelled by the arrival of global jihadists rallying to the black banner of Sunni militancy, intolerant of both Westerners and “heretics” from Shiite and other non-Sunni branches of Islam. Facing this growing Sunni terrorist threat — which indeed did spill back into Iraq — the idea that the CIA or the U.S. military could effectively arm and train a “moderate” rebel force to somehow compete with the Islamists was already delusional, yet that was the “group think” among the Important People of Official Washington, simply organize a “moderate” army to oust Assad and everything would turn out just great. In other words, much of the U.S.-led anti-Islamic State coalition actually has been involved in financing and arming many of the same jihadists that the coalition is now supposedly fighting. If you take into account the lost billions of dollars that the Bush administration dumped on Sunni fighters starting in 2006, you could argue that the U.S.-led coalition bears primary responsibility for creating the problem that it is now confronting. But there remain many doubts about the commitment of these Sunni governments to the cause of fighting the Islamic State and even more doubts about whether that commitment extends to Al Qaeda’s Nusra Front and other jihadist forces. Some neocons have even advocated backing Al Qaeda as the lesser evil both vis a vis the Islamic State and the Assad regime. Yet, the Times editorial on Monday blamed Putin for a big chunk of the Syrian mess because Russia has dared support the internationally recognized Syrian government in the face of vicious foreign-supported terrorism. The Times casts no blame on the United States or its allies for the Syrian horror. The Times also hurled personal insults at Putin as part of its equally one-sided narrative of the Ukraine crisis, which the editorial writers have summarized as simply a case of “Russian aggression” or a “Russian invasion” – ignoring the behind-the-scenes role of neocon Assistant Secretary of State Victoria Nuland in orchestrating the violent overthrow of Ukraine’s elected President Viktor Yanukovych in February 2014. In Monday’s editorial, the Times reported that President Barack Obama “considers Mr. Putin a thug,” though it was President Obama who boasted just last month, “I’ve ordered military action in seven countries,” another inconvenient fact that the Times discreetly leaves out. In other words, who’s the “thug”? “Secretary of State John Kerry, speaking in London on Friday, made it clear that America would be looking for ‘common ground’ in Syria, which could mean keeping Mr. Assad in power temporarily during a transition. The Russians should accept that Mr. Assad must go within a specific time frame, say six months. The objective is a transition government that includes elements of the Assad regime and the opposition. Iran should be part of any deal. Kerry’s apparent willingness to work with the Russians – a position that I’m told Obama shares – is at least a sign that some sanity exists inside the State Department, which initially mounted an absurd and futile attempt to organize an aerial blockade to prevent Russia from flying in any assistance to Syria. If successful, that scheme, emanating from Nuland’s European division, could have collapsed the Syrian regime and opened the gates of Damascus to the Islamic State and/or Al Qaeda. So obsessed are the neocons to achieve their long-held goal of “regime change” in Syria that they would run the risk of turning Syria over to the Islamic State head-choppers and Al Qaeda’s terrorism plotters. However, after the requisite snorting and pawing of hooves, it appears that the cooler heads in the Obama administration may have finally asserted themselves – and perhaps at The New York Times as well.